We all know the importance of date nights in maintaining a connection with your partner, but it can be hard to find the time, especially once you have kids. Have you considered going on a date while you are at Disneyland? If not, I highly recommend it! Restaurants and shops can be found throughout the Downtown Disney District, making it the perfect place for a date night without breaking the bank. Since I still haven’t convinced my spouse to move closer to Disneyland, our trips have always required a long drive or a short flight. Fortunately, we have figured out how to enjoy a date night while there…pack your kids’ grandparents (well, don’t really pack them; they will probably be more comfortable in a seat and be more willing to take part in the next step of our date night plan). We love taking our kiddo to Disneyland, but sometimes it is nice to get a bit of a break from all the action. Visiting the Parks with grandparents or other family members means we may be able to sneak away for a couple of hours of grown-up time in the Happiest Place on Earth. The kiddo gets to enjoy some extra bonding time with Grandma while we get to have an uninterrupted conversation that doesn’t involve snack breaks…or potty breaks…or nap breaks (although, I do love nap breaks). So, now that you have snuck away, what can you do? And, how can you make it happen without spending a lot of extra money? 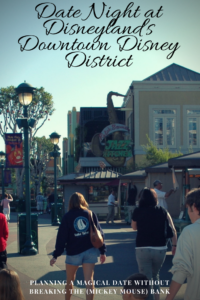 The Downtown Disney District is where to go! You will still be able to experience the Disney magic without purchasing a Park ticket. Not to mention, parking is free for up to two hours, or up to 4 hours with validation from participating locations. The first stop? Trader Sam’s Enchanted Tiki Bar inside the Disneyland Hotel to share a cocktail or appetizer. With it’s tropical ambiance, eclectic and humorous decor, and fruity drink concoctions, this island-themed bar is the perfect kickoff to your date. There is a nice patio, but inside the bar is where all the fun can be found. Be forewarned: volcanoes may spontaneously erupt and bar stools may automatically lower themselves at any time! If you are looking for a fun cocktail to share, try the Uh Oa. This fruity, rum drink comes in a large tiki-inspired bowl made for two (or more) people to share. While the drink is full of deliciousness, the presentation is what really seals the deal. Fire anyone?? Trader Sam’s can fill up quickly, especially during peak Disney months, so try to get there in the early afternoon. Check out their times and menu. This isn’t the place to get a great deal on prices. Regardless, I just love the atmosphere at Trader Sam’s, which is why I recommend sharing one drink or appetizer if you want to keep costs down. Walk off your Uh Oa by walking (or skipping…come on, it is a date after all) over to ESPN Zone’s Sports Arena. Get the blood pumping by challenging your partner to a wicked game of air hockey or a “best out of three” arcade game competition. Disneyland Annual Passholders save up to 15% off food. D23 Gold Members can get a burger, non-alcoholic beverage, and a $15 game card for $20 though December 31, 2017. After that fierce competition with your partner, you may be hungry! Next stop, Tortilla Jo’s for happy hour! On Monday through Friday afternoons, you can get happy hour prices on house margaritas, (some) beer, and sangria (yum! ), as well as a few appetizers. Available happy hour appetizers include mini chorizo tacos served in crispy corn tortillas; puff pastries filled with beef and cheese; skewers made with mangos, cucumber, jicama, and lime; and elite asado (my favorite! ), which is grilled corn on the cob topped with mayonnaise, Cotija cheese, piquin powder, and white truffle oil. Crunchy and tangy, the corn is an unbelievable flavor explosion in your mouth! I have also heard that they won’t charge a corkage fee when you bring your own wine, but that hasn’t been confirmed. To get happy hour prices, make sure to visit Tortilla Jo’s on a weekday, from 2pm-5pm. You can find the menu online. Tortilla Jo’s has allergy-free food choices for most of the top allergens. Meat, beans, rice, and tortillas are often a safe bet. If you want to look beyond the happy hour menu, I highly recommend the chips and guacamole. 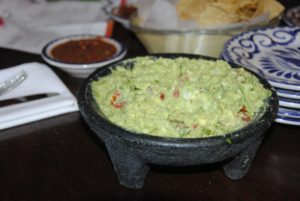 The guacamole is made right at your table, so it can be customized to your liking. Extra onions? Sure. Hate onions? Keep those buggers out! 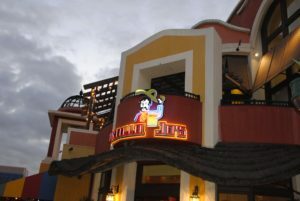 Information on other Downtown Disney dining can be found in Dland Diva’s article here. Next, we like to stroll through Downtown Disney. It is perfect place to window shop and people watch! WonderGround Gallery is our favorite store to explore. It is filled with Disney-inspired works of art and unique novelty items. Wandering around the World of Disney store is another fun choice. Take selfies while wearing funny hats, view Disney art creations, and even play with toys. I can literally spend hours at this store (but maybe not with the hubby…that might be a bit too much Disney for him). 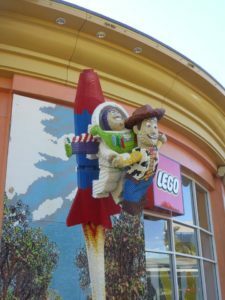 Checking out the second largest Lego Store in the country is another fun idea for your date. The life-size Lego creations are magnificent! When I was kid, building a Lego house with four walls and a door was impressive. Nowadays, there are custom kits that allow you to make anything you can dream of…including a Disney Castle! For more on Downtown Disney shopping, see Disney Diva’s article. If all of this window-shopping has left you tired, now is a great time to find a bench next to one of the water features and relax for a bit. After the sun goes down, the live performers usually come out. This is our absolute most favorite part of the Downtown Disney District! Depending on the the night, the path through Downtown Disney can lead you from a soulful blues singer to a modern pop musician to an extraordinary violinist playing beautiful music. And, it is all free! You can also check out the Ralph Brennan’s Louisiana Jazz Kitchen, which has New Orleans style music on a nightly basis. 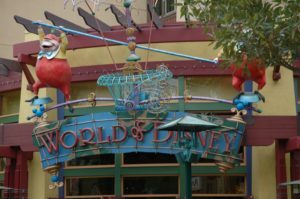 Additional details on entertainment options can be found in Dland Diva’s post. 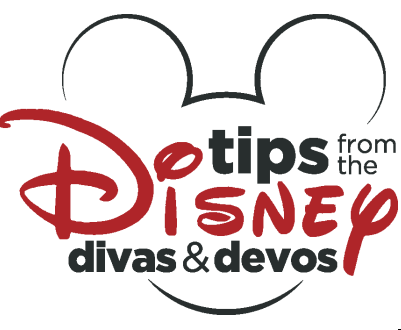 Diva Tip: Check out the Downtown Disney Entertainment Calendar ahead of time to make sure performers will be there on your date night. Lastly, if you and your love have a hankering for something sweet, pick up some warm, doughy beignets covered in powdered sugar at the Louisiana Jazz Kitchen; sweet ice cream (or sorbet for those with dairy allergies) at Haagen Dazs; or sinfully delicious cupcakes at the new Sprinkles (vegan cupcakes are available, which are often allergy-friendly). Kettle corn is another sweet and salty treat sold at one of the stands. No matter where I go, the smell of kettle corn always reminds me of Downtown Disney! There you have it. After all that fun, it is time to head home and tuck the kiddos into bed. Just make sure you wipe the powdered sugar evidence off your face before walking in the door! Spark up your Disney trip! Have a date night! Downtown Disney is a great place to go for Date Night! There is so much to do!! Thanks for the tips and for joining in the blog hop fun. What great tips for a Disney date night! It is definitely a fun place to spend an evening with a loved one!